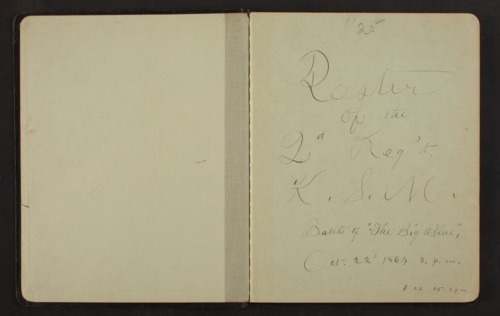 This notebook contains the roster of the 2nd Regiment of the Kansas Militia during the Battle of the Blue, which occurred on October 22, 1864, in Jackson County, Missouri. Members of the regiment are divided by company and identified by rank. Some individuals are listed as killed, wounded, or taken prisoner, in addition to their place of residence. The notebook also contains the meeting minutes for the Society of the Anniversary of the Battle of the Blue. Surviving members of the 2nd Regiment convened on May 30, 1895, in Topeka, Kansas, and voted for a permanent organization to meet on October 22 of each year. Samuel J. Reader was elected secretary.